We are using AWS RDS integration with New Relic. We looked but could not find anywhere the RDS free space percentage as we would like to alert on when the RDS storage is at 80%+ used. 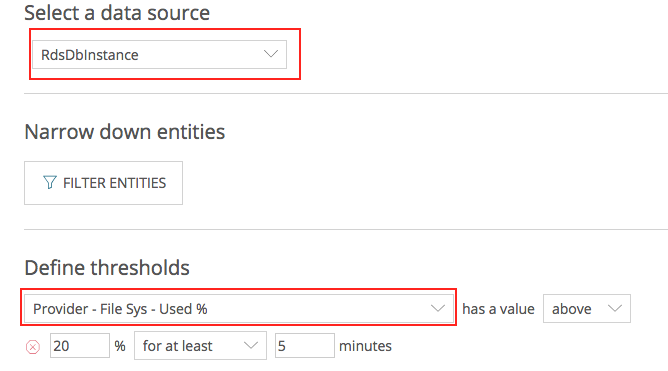 We found the AWS data in Insight’s DatastoreSample but not sure if we could use the data here to derive the percentage used. Are we just overlooking the RDS free space percentage or does anyone have a NRQL query that could derive it for us? Thanks. Amazon does not offer this metric at a basic monitoring level – we pull down freeStorageSpace, but not total storage space or a percentage used metric. This is not our limitation, but rather one that Amazon imposes. However, Amazon Enhanced Monitoring is available from AWS for a fee. You can read more about this feature of AWS in Amazon’s documentation. With this level of monitoring enabled, we will then collect fileSys.usedPercent and an alert can be set up to monitor that metric (see our documentation on this at this link). Note that this metric will be collected per instance. We’re just trying to do something similar; we have AWS Enhanced Monitoring enabled and can see “Available Disk Space %” graphed in our AWS RDS console. However, we don’t see that in New Relic as an option in the pull-down list under “Define thresholds” when we create a new alert from an RdsDbInstance data source in our integrations. Thank you for reaching out. With RDS Enhanced Monitoring enabled you should have access to the FileSys metrics. Are you not able to see the FileSys metrics as shown in the screenshots? We hope this is useful! Cheers!